WP Edit Pro version 4.0 is scheduled to be released later today. In this new version; the code has been completely updated. The new WP Edit Pro uses a single options array for storing options in the database. This will help tremendously with page load times. Instead of making multiple calls to the database to grab options; a single call is made when the plugin is loaded. When you first visit the WP Edit Pro 4.0 admin page; a notice will appear asking to “Convert Options”. Please convert the options. If it is a network install; the options will need to be converted for each sub-site. Most of the new features have been added to network activated installations. Now, when WP Edit Pro is network activated, the plugin will “adjust” the settings which are loaded onto the page. This allows a network admin to administer each sub-site options directly from the WP Edit Pro settings page. A new tab has been added named “Network”. 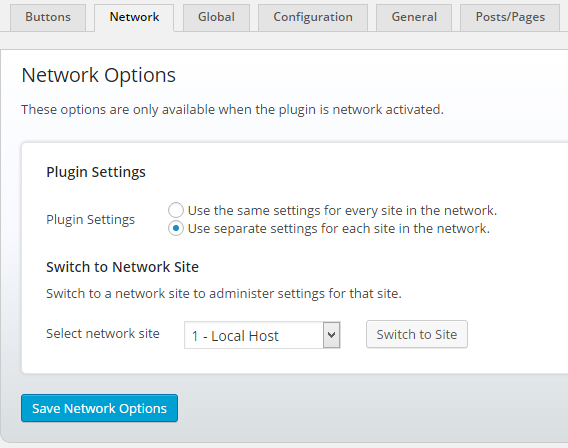 These options are only available when the plugin is network activated. A network admin can select the sub-site to administer from the dropdown box under the “Network” tab (more below). Once the options have been configured and saved; simply click the button to cancel editing the sub-site options. Each of the sub-site options are stored in the corresponding sub-sites “wp_options” table. So, when users visit that site; those corresponding options are loaded. This allows each sub-site to have independent WP Edit Pro settings. From the “Network” tab, when network activated, the administrator can select the administration mode. Possible modes are “Same” and “Separate”. When set to “Same”; all sub-sites will use the options stored in the “wp_sitemeta” table. This means, all sub-sites will use the same options that are appearing on the WP Edit Pro settings page. When set to “Separate’; a dropdown selector will become available which will allow selection between sub-sites. First, select the sub-site; it’s corresponding options will be loaded into the WP Edit Pro settings page. Now, administer the sub-site settings just like normal. When finished; click the button at the top of the WP Edit Pro settings page, “Cancel Editing Options”. This mode allows each sub-site to use independent plugin settings. It is important to click the button to “Cancel Editing Options” when editing sub-site options. A jQuery alert has been placed in the code to alert the user if they are trying to navigate away from the WP Edit Pro settings page before canceling the sub-site editing options. WP Edit Pro version 4.0 introduces a new method for managing created editors. The old option of selecting “custom roles” or “WordPress roles” has been removed. There is no longer a need to have to select between those modes. WordPress Role Editors – These are for WordPress roles. Each role can have a separate set of buttons. Custom roles will also appear here. WordPress Capability Editors – These are for WordPress capabilities. Each capability can have a separate set of buttons. Custom capabilities will also appear here. WordPress User Editors – These are for specific WordPress users. Each user can have a separate set of buttons. There is a hierarchy to how editors are displayed to users. Say an editor has been created for a user; but an editor has also been created for that users role. In this case; the users personal editor will “trump” the editor created for the users role. Another instance might be an editor is created for both a users role and the users capability. In this case; the users capability editor will “trump” the users role editor. Think of it in terms of specificity to the user. The role editors are the most broad… so they less user specific. The user editors are most user specific; and if created for a user, will trump both a capability editor and a role editor. When two or more capability editors have been created; they can be sorted in the “Created Editors” table (below the button configuration settings). WordPress users can have multiple capabilities. If multiple capability editors are created; and a user exists in two or more of the capabilities; the one listed towards the top of the sortable list will be used. A new feature has been added (“Editor” tab) which allows creation of custom colors to be saved. These saved colors will appear when clicking the “Font Color” button; making it easy to quickly apply a custom color to selected text. The editor stylesheet (“Styles” tab) is now saved in the WordPress “wp-content/uploads” directory. It has been moved out of the plugin directory. This is because when located in the plugin directory; the file is being over-written with each plugin update. If there is custom CSS in this editor; please save the editor stylesheet again, so it will be added to the new location. Another feature update is the ability to allow different user roles to access the “User Specific” options. After selecting which user roles should have access; a new admin menu item will be added to that users role, allowing them to access and change the user specific options independently. The “Import Options” and “Export Options” now work with the new single array of options. Please do not attempt to “Import” a file that was exported using the old options configuration. This may result in unexpected behavior. Instead, first convert the options (explained above), and then “Export” the settings again (so it will use the new configuration). This can then be imported successfully. The Responsive File Manager will also be updated today or tomorrow. A separate post will be written to explain the changes and adjustments. As always, please use the plugin Support Forum to report any bugs. Your time in this matter is most appreciated; as it will help solidify the plugin code.